Darnell Nurse – Nurse had a breakout season and proved he is a capable top 4 defensemen with the potential to being a solid top pairing guy. If the Oilers can afford it I think it would be wise to lock up Nurse in a long term contract now rather than going with a bridge deal and paying later. I would like to see Nurse signed for 6-8 years in the $4.5M range. Ryan Strome – Strome is a pretty solid 3rd line C and at 24 yrs old still has a chance to improve in a few areas. He’s been part of the solution for the Oilers penalty kill late in the season and can play on the 2nd power play unit as well. The minimum qualifying offer the Oilers can extend to Strome to prevent him from becoming a UFA is $3M and I like that price tag if they can get him to commit for 3+ years. Matthew Benning – Benning seemed to take a step back this season as compared to his rookie campaign in 2016-17 but as we know defensemen don’t progress in straight lines and I think Benning does have a future in Edmonton. I think the Oilers will sign Benning to a short term ‘show me’ contract in the low million dollar range, say $1.2M for 1 year. Drake Caggiula – The coach seems to love him and he does show flashes of being a competent top 9 forward but hasn’t been able to consistently produce in the NHL. I would bring Caggiula back on a short term deal similar to Bennings. Anton Slepyshev – Slepyshev had a very disappointing season this year after a great showing in the playoffs last season. After an early season injury Anton was never able to get back into the lineup in a consistent role and other than a brief time in Feb he wasn’t able to produce. I think Slepyshev could have success in the NHL but I’ll be surprised if he doesn’t go back to Russia in the off season. Iiro Pakarinen – He can kill penalties and hits but 3 points in 40 games just isn’t good enough to stay in the NHL. I think the Oilers will bring him back for under $1M but he’ll be sent to the AHL and won’t count toward the cap. Total RFA’s – 4 resigned for roughly $10M. Mike Cammalleri – If Cammalleri doesn’t retire I wouldn’t be against Edmonton bring him back for another year at $1M. If he does retire or decides to move on the Oilers will likely look to sign another veteran in the same range. 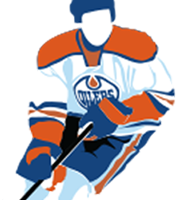 Ty Rattie – By no means do I think it’s wise to pencil Rattie in on McDavid’s wing for next season but I do think his late season call up has earned him another contract. He has the potential to be a value deal for the Oilers. I would like to see him signed for multiple years at a cap close to $1M. Yohann Auvitu – I don’t expect to see Auvitu resigned. Total UFA’s – 2 resigned for roughly $2M. Assuming Slepyshev and Pakarinen are not resigned the Oilers will need to bring in 2 players to replace them. One will likely be Kailer Yamamoto who is on an entry level contract with a cap hit of $925k and potential bonuses of another $230k that will count against the cap if he reaches them. The other replacement player could be a guy like Brad Malone who will can bring some energy on the 4th line, kill penalties or sit in the press box. Ok Great. We’re under the cap right? Yeah, technically we’re under the cap. I’m counting 23 guys on the NHL roster with a cap hit of $76M and bonuses of $2.7M so even if the cap comes in at $78M the Oilers can get in under it. The problem is that this roster is basically the same one that missed the playoffs by 17 pts this season and to have any improvement we need to rely on guys like Ty Ratti, Drake Cagguila, Matt Benning, Jesse Puljujarvi and Kailer Yamamoto to have an impact in the NHL and for veterans Andrej Sekera, Oscar Klefbom and Milan Lucic to stay healthy and have bounce back seasons. To be completely honest it sounds similar to the hope and a prayer the Oilers went into the 2017-18 season and probably wouldn’t be wise to repeat. What do the Oilers need to be a contender? They need to add an impact top 6 forward and an impact top 4 defenseman to the roster if they really want to get to the next level and start being a legit cup contender. The problem is they have to acquire these pieces without trading away the impact players already on the roster (Nuge and Klefbom come to mind). They also don’t have the cap space to sign these pieces in the UFA season or to trade picks/prospects for them. If cap money is coming in than at least as much or more cap space needs to be going out. The ideal players to move in trades all have a NMC (Lucic, Russell, Sekera) so clearing cap space will be a really struggle for whoever the Oilers GM will be this offseason. It’s ironic that the player I think is hurting the team the most is next to impossible to move. Lucic has a NMC so the Oilers can’t trade him and the cap hit on a buyout is too high to make it worth it. I think Russell has value for the team and is a solid 3rd pairing guy but at $4M he is part of the problem and that cap hit in the 20-21 season would be enough for me to resist the buyout. Sigh. That leaves Sekera who has 3 years left at a $5.5M cap hit and turns 32 years old in June. Sekera was arguably our best defenseman last season but this past season he missed 46 games after offseason knee surgery and really didn’t look like the same player when he was in the lineup. I like Sekera’s odds of rebounding next season and I’m not convinced that $3M – $4M saved via buyout would do anything more than find a replacement for Sekera. Buyouts really aren’t an option for Lucic or Russell and would really just be a lateral move to buyout Sekera as his replacement would likely cost the team as much or more as the buyout would save them. So unless the cap increases to $82M next season the Oilers are either going to have to get very creative to find cap space or go into next season with a lot of question marks. FIRE CHIA NOW and lets hope we can do better next season.